Often times when we think about spending money on luxuries we tend to relate it to going against our budget. Every once in awhile it's ok to be a little naughty and make those irrational and impulse buys but there are also solutions that will allow you to treat yourself without feeling guilty or having to compromise on your taste. Personally, the only thing that I love more than a bargain is a bargain on a luxury that makes me feel like my money was well spent! The golden rule to being a savvy shopper is realizing that the best deals aren't just going to fall into your lap. Affordable luxuries are sorta like hidden treasures, you have to seek them out yet they're pretty much accessible to everyone. Here are 3 tips to help you stay on top of life's little luxuries without putting a strain on your wallet. An ongoing trend that I've seen flourish over the past year or so have been invite-only shopping sites. These sites usually carry tons of designer items and offer them at more than a fraction off the original price. I'm talking huge deals, from 50-90% off. The only catch is that you have to act fast because they do sell out pretty quickly. The good news is that most of these sites have weekly sales so you're almost always bound to find something that catches your eye. While some sites are more exclusive than others, there are shops that are pretty lenient with their invitations. When shopping with invite-only shops it's always a good idea to join their mailing lists for regular email updates, that way you'll never miss out on a bargain that's just too good to pass up. Searching the Sunday paper and online coupons can only get you so far. Sometimes it's necessary to go a step further to find your perfect bargain. There are tons of 'group coupon' sites floating the web that have become one of the most revolutionary money saving resources. These sites work similar to invite shopping sites except instead of offering online-only deals they offer coupons on everyday goods and services that are in your own neighborhood. I don't know about you but I'm always a front runner when it comes to a local bargain, sometimes you need that instant gratification versus waiting for something to ship to you. Some of these sites also include daily deals from 50-90% off. Can you imagine getting 60% off a day filled of pampering at your favorite luxury spa? Sounds sweet to me! 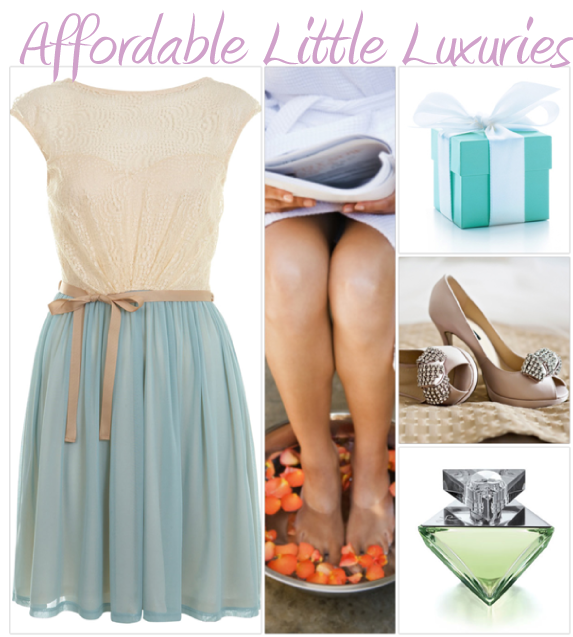 How do you treat yourself to affordable little luxuries? Disclosure: Compensation was provided by Fifth Third Bank via Glam Media. The opinions expressed herein are those of my own and are not indicative of the opinions of Fifth Third Bank. I'm on a billion email lists so I get all the 20% off and free shipping codes.